Getting Married? Schedule a Free Consultation to see if Permanent Makeup is right for you! Permanent makeup is applied using a technique known as micropigmentation. Different pigmentation colors are used to achieve the desired look. The process is similar to a tattoo procedure, and is used to give a permanent appearance of makeup. It gives the client a natural and younger look, and the freedom and confidence to go out with no makeup on. Most clients choose to have their eyebrows eyeliners and lips done. 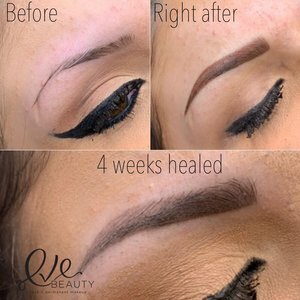 Here at Eve Permanent Beauty, we believe the most important part of permanent makeup is choosing a professional, licensed makeup artist that can best create the look you desire. Eve Permanent Beauty will ensure the utmost satisfaction; from the shape and style to the right pigmentation color and shade. offered at our Wakefield Location. All Brow Services include a consultation, personalized brow measure & shape, and initial first visit. On the rare occasion, for clients who are recreating the entire brow shape, you may need a third appointment, this will be discussed with you during your consultation. Please allow 2 hours for your first appointment & one hour for a perfecting follow up appointment. Follow us on Instagram @evebeautyma to see our work. The most 'Natural' look of all the techniques. The artist places individual hair like strokes throughout the brows by using the Microblading method of digital pen technique. Your natural eyebrow hairs will not be damaged and will continue to grow normally. Not recommended for clients with oily skin. After application, the skin heals and the pigment is covered by the epidermis, which gives a softer and more natural look than its initial application. Brows are filled with a gradual shading of one color which gives it a 'powdered' look similar to makeup. It will create an eyebrow that is thicker, reshaped, and darkened to suit your face and style. Great for clients with oily skin and those who prefer a defined makeup look. fronts of your brows to create a softer start, whilst finishing off with a strong defined powdered tail. Available for existing customers only. If you are out of the 18-month period, the prices will return to its full price. 6 week perfecting follow up appointment. This allows the artist to make necessary adjustments. Please allow 2.5 hours for procedures & 1.5 hours for a perfecting follow up appointment 6 weeks later. Lips are outlined in a color of your choice to enhance and define your natural lips. Lips are lined in a color of your choice and then the color is blended down into the lips. It is a perfect treatment to create a 'Plumper' fuller looking shape. Wake up each morning with a low maintenance but fabulous look. 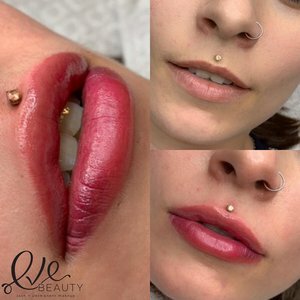 Lip Tint Tattoo is a subtle approach to achieve a fuller lip using naturally toned pigments to blend and shade within or outside the natural lip line. We tailor to your dream lip shade with the choice of either rich definition or subtle shading. This ground-breaking lip formula infuses the lips with collagen amino acids to help reduce the appearance of vertical lip lines and wrinkles in order to achieve a plumper, fuller, and more youthful appearance. It promotes healthy, natural collagen and microcirculation, instantly smoothing and softening the lips and entire lip area. This lip tattoo brings back the color to your lips and defines the line. On the first day, Your lips will look like lipstick was applied but it will soften as they heal resulting in a subtle, natural looking lip tint. Apply a little gloss or balm and your lips look kissable! All Eyeliner Services include a consultation, personalized eye measure & shape, initial first visit AND a perfecting follow up appointment 6 weeks later. This allows the artist to make necessary adjustments. Please allow 2.5 hours for this procedure & 1.5 hours for your perfecting follow-up appointment 6 weeks later. to bring extra accentuation to the eyes and even more definition to their frame. The most Natural form of eyeliner. Simple and elegant. The liner is taken throughout the lashes to make the eyes appear brighter and bigger. Achieves a gorgeous 'eyelash tint' look. This procedure is favored among those who don’t have time for daily makeup application, allergy sufferers, and those with sensitivity with contact lenses -- ditch smudging and smearing eyeliner for a permanent, subtle, and beautiful look that lasts 24/7. Whether you’re looking for a bold appearance or a natural one, the color and style of eyeliner shape you choose will be consulted with you beforehand to ensure the look will be perfectly tapered and extended to enhance and complement your eyes. Wake up every day without having to apply eyeliner! Poorly done permanent makeup? Let us help you! for permanent makeup on the face as well as for lightening small body tattoos. Permanent Makeup is right for you!